You’ve got to hand it to the folks at Moody Yachts: it takes guts to build two 45-foot cruising boats that occupy opposite ends of the design spectrum. Yet it’s easy to see the logic behind such a strategy. You’ve got to hand it to the folks at Moody Yachts: it takes guts to build two 45-foot cruising boats that occupy opposite ends of the design spectrum. Yet it’s easy to see the logic behind such a strategy. The DS45 is a hyper-modern deck-saloon cruiser that demands attention—and elicits a reaction—wherever it goes, while the traditional-looking AC45 (aft cockpit) is much more understated. Each should appeal to very different buyers, thereby maximizing the company’s appeal.  I took the AC45 out for a test sail off Newport, Rhode Island to see how long-time Moody designer Bill Dixon and his team accomplished the difficult mission of reimagining the future while still staying true to the past. The hull is cored with foam below the waterline and balsa above the waterline, and is laminated with polyester resin and a vinylester outer layer to resist blistering. The deck is also cored with balsa. Solid structural components, along with the bulkheads and furniture modules, are tabbed in place. The keel is cast iron with a lead ballast bulb. The 9/10ths rig has two spreaders, and the mast and boom are anodized aluminum. 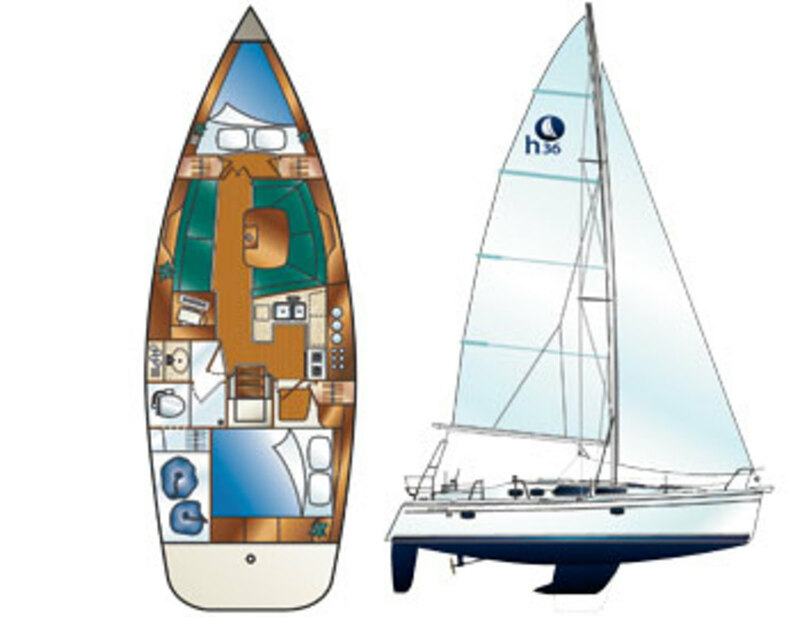 The AC45 pays homage to yachting’s past, with a traditional profile that benefits from numerous small oval ports and carries minimal freeboard, so that it appears almost—dare I say—Herreshoff-esque. Stepping aboard, I loved the enormous cockpit with its long, comfortable benches and sculpted helm seats. 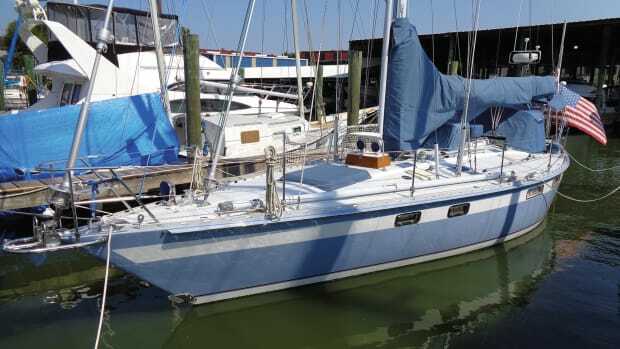 I also appreciated the way the drop-down swim platform is tastefully hidden behind the wide classic transom and easily accessed between the dual helms and split backstay. The low-slung coachroof offers clean sightlines in all directions. Other on-deck elements are pretty straightforward and both well constructed and installed. There are nice big cockpit lockers to swallow things like docklines and fenders, the built-in teak pulpit seats are comfortable and classy, and it’s easy to go forward, thanks to the low coachroof and wide side decks. Stepping below, I found a wealth of varnished furniture and cabinets with classic rattan inserts in the doors. These both aid in ventilation and lend the interior an ultra-traditional look. 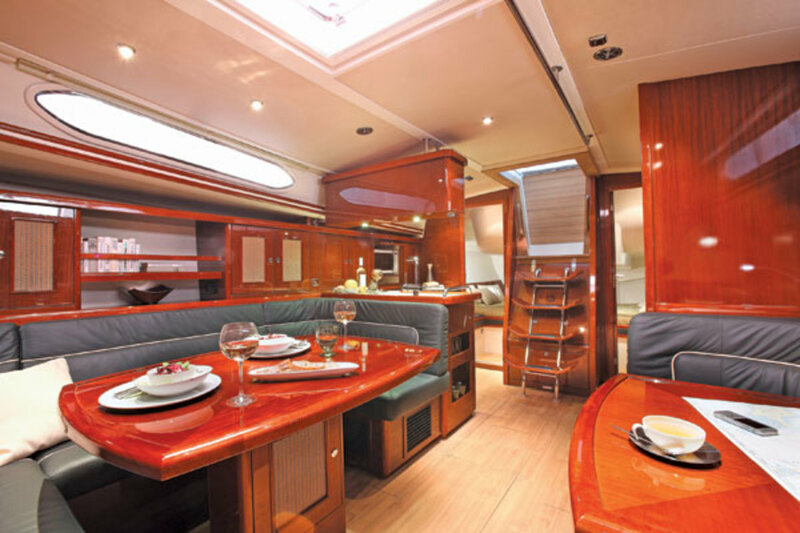 The U-shaped galley has a good-sized fridge, a two-burner stove and plenty of stowage and counter space. 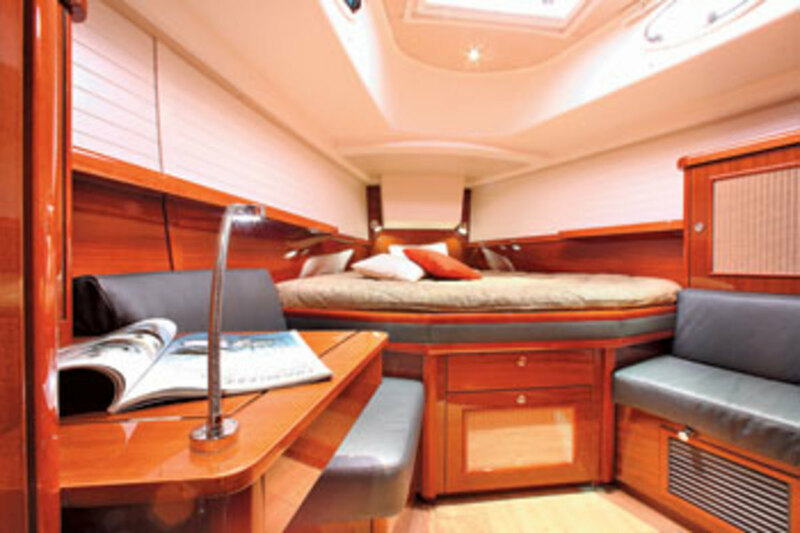 The saloon also has an abundance of stowage and includes a curved settee that is plenty long for stretching out on. It’s hard to provide 6ft 5in of headroom in the saloon of a 45-footer while keeping the coachroof profile low, but Dixon has done it. I did feel like I was “descending” into the hull as I entered the saloon, but that headroom has to come from somewhere. The small oval ports do not let in as much light as the big ports found on most modern 45-footers, but the large opening hatch helps keep things bright. There are no surprises in the sleeping cabins. The master forward includes a large double berth, a bench seat and an ensuite head. The berths in the guest cabins are on the small side, but adequate. 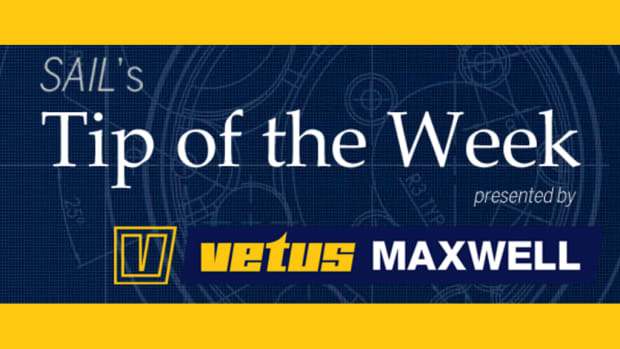 Overall workmanship and joinery quality is excellent. I granted myself a moment or two during our test sail to appreciate the simple joy of sailing on a sunny autumn day in perfect conditions—12 knots of breeze and flat water. In reality, though, Mother Nature only deserved part of the credit. 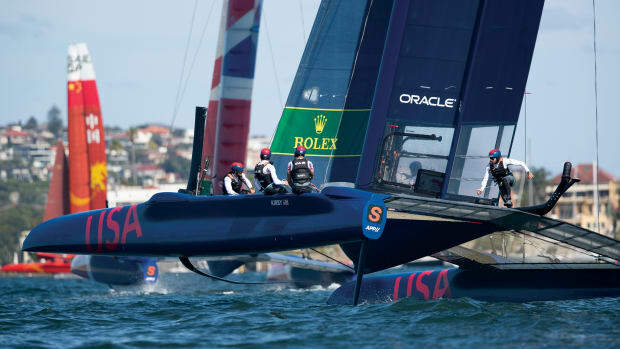 The fact is, the AC45 sailed well and made me feel good just being at its helm. I’ll be the first to admit that “feeling good” is hardly a quantitative measure of sailing performance. But I think I can explain my “analysis” in more concrete terms. First, as I said earlier, visibility from the cockpit is outstanding. 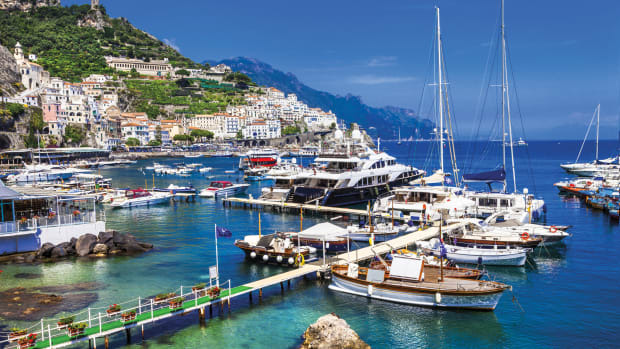 And while the feeling of being connected to the environment that comes from an unhindered view forward is a precious commodity on any boat, it can be especially so on a big cruiser. 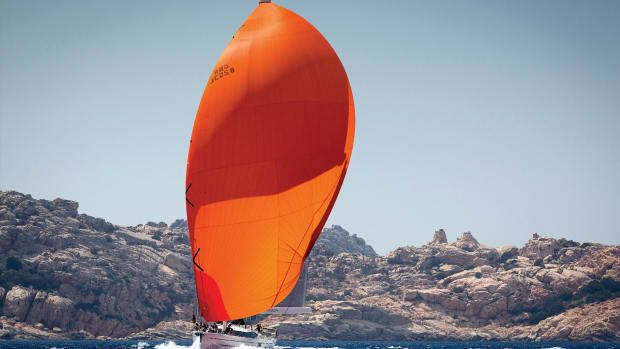 The AC45’s well-built windshield plays a big role in ensuring this excellent visibility. While it provides good spray protection, it is much easier to see through than the clear plastic windows on most dodgers. Second, the boat has a wide upwind groove and tracks effortlessly. Boat speeds hovered in the 6-knot range, and the wake gurgling past as I sat at the leeward helm station was ever-so-satisfying. 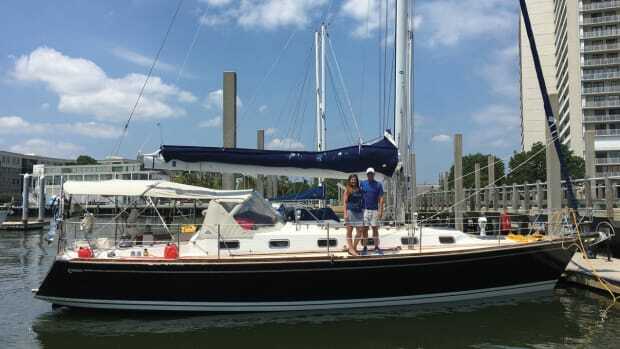 The boat was equally easy to handle coming about, thanks to its self-tacking jib and responsive helm. When the time came to trim the sails, the jibsheets and double-ended main were all within easy reach. Speeds stayed in the 6-knot range as we cracked off a bit, and the helm remained easy to manage. In short, the boat did everything I asked with aplomb. 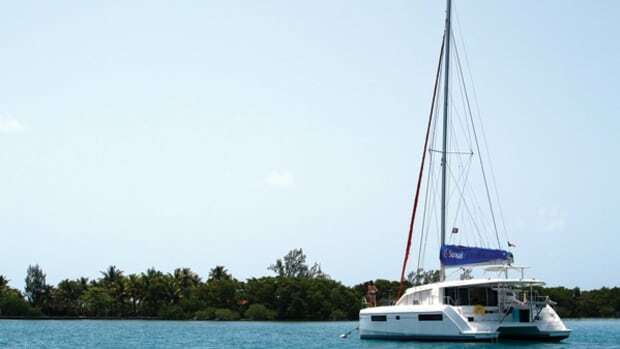 Sailing conditions were so ideal we hardly needed to start the 55 horsepower engine, but when we did, the boat maneuvered predictably and developed 7.5 knots of speed at cruising revolutions. Engine noise was noticeable down below, but not so loud as to be objectionable. I’m sure Bill Dixon and his team had a blast designing two such diverse boats as the Moody DS45 and the Moody AC45 at roughly the same time. There’s no doubt that with the AC45 he succeeded in putting a new spin on the traditional “cruiser” concept. 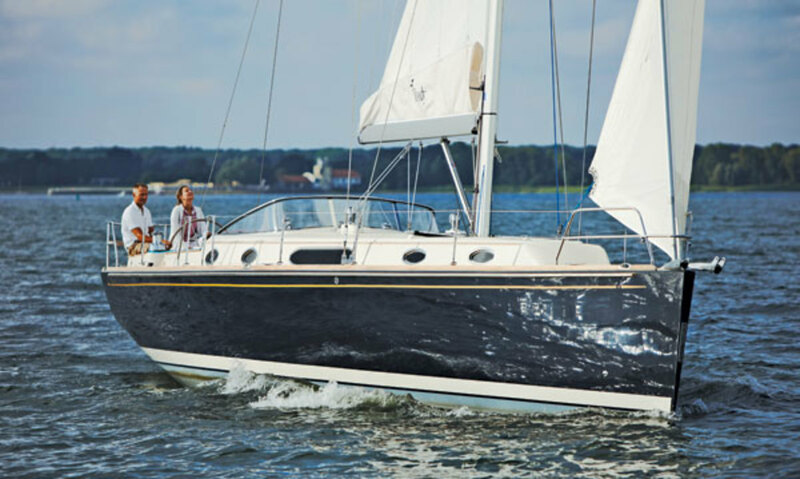 If you’re the kind of person who likes a well-built modern boat that sails well and reflects yachting’s traditional side, the AC45 may be just for the thing for you.